Emerald Halo Diamond Engagement Ring in 14k Rose Gold | Shane Co.
Thirty-two round diamonds, at approximately .41 carat total weight, provide a sparkling backdrop in this emerald halo engagement ring perfect to accent the center .75 carat emerald cut diamond of your choice. 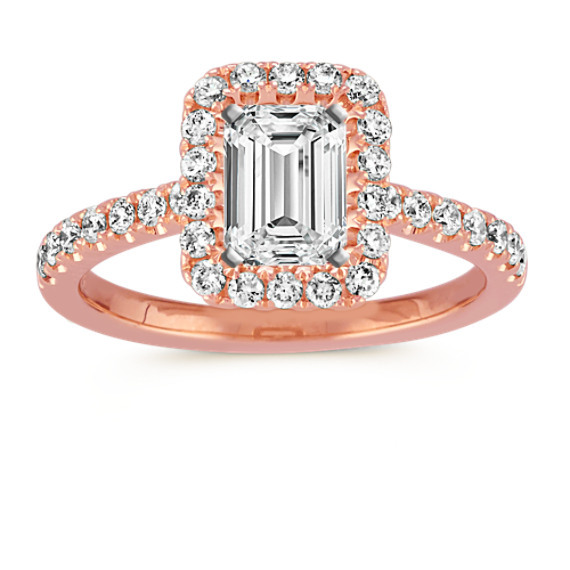 Each diamond has been hand-selected for exceptional brilliance and pavé-set in quality 14 karat rose gold. This 2mm engagement ring is a lovely choice your special someone will adore for a lifetime. My fiance picked out this beautiful pave rose gold ring with a halo and 1 carat emerald cut diamond. It shines incredible and the pave diamonds reflect rainbow light. This style is unique- haven't seen anyone else with anything similar!